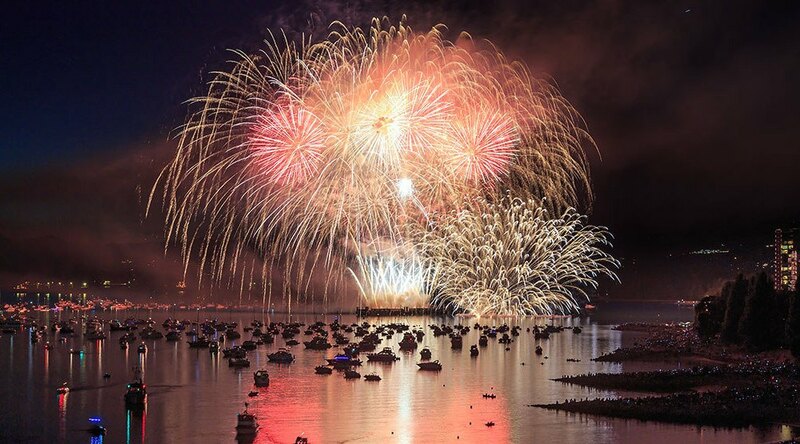 Every year, a panel of judges are given the duty to determine the winning national team for the Honda Celebration of Light fireworks competition. For this year, Daily Hive Features Editor and New Year’s Eve Vancouver Co-Founder and Board Member Kenneth Chan was chosen to be one of the six judges for this year’s competition. On the judging panel, Kenneth is joined by Vancouver City Councillor Raymond Louie, Vancouver Park Board Chair and Commissioner Sarah Kirby-Yung, Global BC Senior Meteorologist Kristi Gordon, West End Business Improvement Association’s Lisa Arthurs, and Concord Pacific Senior Vice-President of Planning Matt Meehan. 10 points – Sizing of the show and good balance in show size: From beginning to end, the best shows will have good highs, lows, and a big finale. Smaller and less frequent fireworks sections could either build towards a climax or reflect the slow-paced music being played. 30 points – Overall design and artistry, thoughtfulness, visual structure, and rhythm: The fireworks display should match with the soundtrack, which should deliver a theme. Furthermore, there should also be an emotional response – it’s not just about big explosions. 20 points – Synchronization and timing: The fireworks and other pyrotechnic effects are well-timed and synchronized from the start to the end of the song, right down to the very last note. 15 points – Originality of effects and new and novel effects: The use of new products and orchestration of original scenes. 15 points – Quality of soundtrack is professional and well interpreted with connections: A high-quality, professional, and fluid soundtrack mix that interprets the theme well, with highs and lows that provide breathing space and entice excitement, emotional responses, and anticipations. 10 points – Quality of fireworks is of good quality with technical precision: The best shows use quality constructed fireworks and produce less smoke (with wind and humidity conditions taken into consideration). Fireworks should explode and colour properly; unplanned low breaks and ground explosions are obviously undesired. Each competing nation, represented by a fireworks company based in the country it represents, is judged based on a maximum score of 100 total points. A nation could be penalized by up to five points by the Technical Director for showing a lack of professionalism, sloppy installation or disregard of local safety regulations. This year’s competitors are Royal Fireworks representing the Netherlands (Saturday, July 23), Howards’ Fireworks representing Australia (Wednesday, July 27), and the Walt Disney Company’s Creative Entertainment division representing the United States (Saturday, July 30). Specifically for USA night, the team responsible for all of Walt Disney World’s fireworks displays in Florida is responsible for designing the final Celebration of Light show of the year. Some recent past winners of the competition are Canada in 2013 and 2015, Japan in 2014, Italy in 2012, China in 2011 and 2009, and Spain in 2010. What does the Celebration of Light mean to you? Well, I’ve only missed a handful of shows since childhood, way back when it was known as the Symphony of Fire. I live very close to Trimble Park in Point Grey, and that’s always a popular hillside area in the neighbourhood for hundreds or even a thousand people to gather and watch the fireworks. You could say it’s pretty much an annual summertime tradition for my family, but in recent years I’ve pursued the ‘best experience’ by being with the crowds down at English Bay Beach. Did the Celebration of Light inspire you to bring back New Year’s Eve celebrations to Vancouver? I co-founded the New Year’s Eve initiative with friend and Daily Hive co-founder Karm Sumal back in 2012. At the time, I think we were much more inspired by the success of the Olympics, the atmosphere it brought to the city streets, but the Celebration of Light was definitely taken into consideration. In essence, we want New Year’s Eve celebrations at Canada Place and on the Coal Harbour waterfront to grow into the wintertime equivalent of the Celebration of Light. It’s all about building a sense of civic pride and community. As a judge, what are you looking for from this year’s competitors? Fireworks that synchronize with the soundtrack. It’s not just about having a great soundtrack or the big explosions, which is particularly important for the finale, but it needs to flow and go well with the music. Hopefully we’ll see some creative designs and new types of fireworks this year. What are your thoughts on the calibre of this year’s competitors? The three teams in this year’s competition are truly world-class. The Australian team, Howards’ Fireworks, are a multi-generational family institution spanning almost a century and they’ve been responsible for some technical innovations in the industry. They’ve done huge shows for two recent Commonwealth Games opening and closing ceremonies. Royal Fireworks from the Netherlands is less known, but they’ve won top awards in other major internationally renowned fireworks competitions. Their show on Saturday in Vancouver was very technically ambitious, I don’t recall ever seeing a Celebration of Light show using so many single shots. I’ve been told there were over 1,000 single shots. Everyone is particularly excited about Disney and rightly so, and if you want to get a good view this Saturday you better come early. They do huge fireworks shows every night at their theme parks around the world, and they spend a lot of money on research and development… there’s a lot of experience from this team. They’re renowned for their precision and ability to deliver shows that create an emotional response.